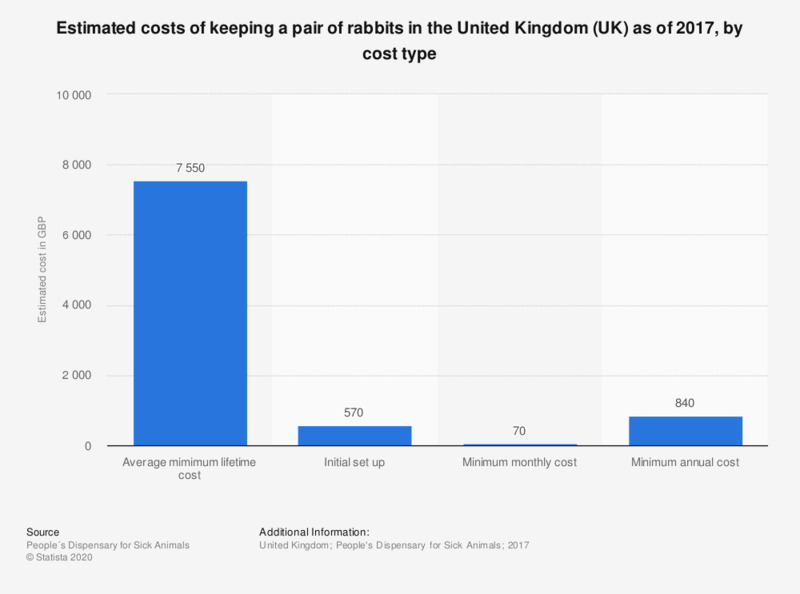 This statistic shows the estimated costs (initial, monthly, annual and lifetime) of keeping a pair of rabbits in the United Kingdom (UK) as of 2017. According to the estimates, the minimum annual cost of keeping a pair of rabbits is 840 British pounds. * Estimates are based on current market prices. Initial costs include waterproof home, food bowls, water bottles, carrier and grooming equipment. Not including cost of animals. Monthly costs include preventative treatments (regular treatments for worms and fleas, annual boosters, two flystrike preventions in summer months), in addition to insurance, food, toys and litter. Annual costs calculated by multiplying monthly cost by twelve. Lifetime costs calculated by multiplying annual cost by average lifespan of a cat. Estimated according to O'Neill (2015) as 14 years. Average calculated by finding mid point in range given by the source.